This is one of three 5G base transceiver stations test broadcasted at this time, according to Viettel. The other two 5G stations are deployed at Viettel Net office at No. 19 Duy Tan and Viettel Grop office at No.1 Tran Huu Duc, in Hanoi. In early May, the base transceiver stations are expected to be officially broadcasted, bringing the first experience of 5G service in Vietnam. 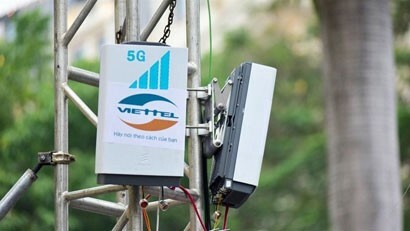 According to a Viettel representative, in June 2019, 70 base transceiver stations of fifth generation 5G will be tested in Hanoi and Ho Chi Minh City, to prepare to deploy a large-scale 5G network. At the ASEAN Conference on 5G recently held in Vietnam, Deputy Prime Minister Vu Duc Dam highly appreciated the Ministry of Information and Communications in coordinating with ASEAN countries and international organizations to organize the conference on 5G in Hanoi. According to the Deputy PM, the conference not only covers technological issues, but also has great significance for Vietnam and ASEAN countries in the cooperation of digital economic development. 5G is scheduled to create a new generation of Internet, with artificial intelligence and blockchain which will fundamentally change the world's new production methods. According to Minister of Information and Communications Nguyen Manh Hung, 5G is an opportunity for Vietnam to change the rankings in the world. Vietnam has ambitions to be among the world’s first countries to launch 5G networks in 2020, with a testing phase expected in 2019. Viettel is the leading enterprise with the deployment of the base transceiver stations.